Your resource for Texas bike rides, Texas bike shops and more. I’ve been riding the 2012 Orbea Terra TLT cyclocross bike with Shimano Ultegra for about 700 miles now, and have raced four or five cyclocross races with it, so I thought I’d write up a review for anyone considering this bike. One of the first things I noticed about this bike when I got it was how well the Shimano Ultegra group works on the bike. To give you a little bit of backstory, this is my first cyclocross bike. My previous road bikes for about a decade have come with either SRAM Red (on my newest road bike), Campy Record 10 (on my previous two road bikes), and Dura Ace before that. I discovered that new Ultegra shifts like a champ, and found that the front derailleur is superior to the SRAM Red on my road bike. I am extremely pleased with it. The next thing I noticed on the bike was that it felt like it had no brakes at all! This is a common cyclocross bike issue when you use full cantilever brakes combined with road levers. It feels like it takes all of your upper arm and hand strength to slow down, and I was not even able to lock up the rear wheel. It felt a little dangerous until I got used to it. I think you probably get enough stopping power in reality, but it feels really terrible, so I decided to change them out. Full cantilever brakes offer very good modulation, and extremely good mud shedding ability. But the trade off is raw stopping power. 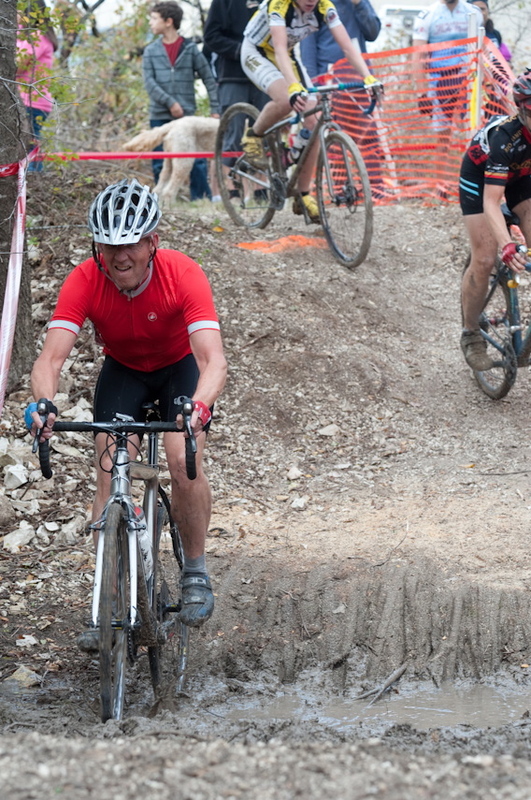 On a cyclocross course, you don’t really need the kind of stopping ability that you need on a singletrack trail. But you see a lot of cyclocross bikes sporting V brakes these days, and some of the newer cx bikes even have disc brakes. I didn’t want to go with a disc brake cyclocross bike because it limits your wheel choices. With standard brakes, you can throw a set of regular road wheels on your cyclocross bike. I ended up swapping out the cantilever brakes for these TRP CX9 V brakes, which are outstanding. I ended up swapping the brakes for a pair of TRP CX9 brakes, which are terrific. They were so much more powerful that I ended up skidding the back tire a few times the first 10 minutes I rode with them, because I was so used to the “grab and pray” action of the brakes that came on the bike. I’ve also heard great things about Avid Shorties. The Vittoria Cross XG Pro 700×32 tires that come on the bike are fast and grip well, but I pinch flatted the front tire going through a ditch in a cyclocross race and blew out a sidewall. So I replaced the front tire with a Challenge Grifo 700×32 tire. I put in a Slime prefilled tube in spite of the extra weight, just to keep it from flatting again. I have been happy with that tire. It doesn’t roll nearly as fast as the Vittoria did, it does grip a little bit better off road. The wheels are Mavic Ksyrium Equipe, which are both light and strong. The Terra is a carbon frame, and even comes with a carbon seat post. So it’s plenty light and stiff. The BB30 bottom bracket setup only adds to the stiffness, and you can really feel the transmission of power from the pedals to the wheels. One thing you notice when you look at the frame is that it has a straight top tube, and that the cables are all mounted on the drivetrain side of the top tube. The straight top tube means that you can easily shoulder the bike when you pick it up to run over barriers. 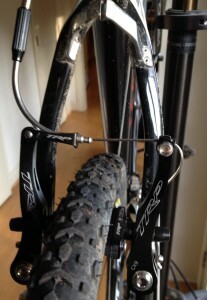 And the side mounted cables stay out of your way when you are carrying the bike, and when you mount and dismount. The cables are Gore Ride-On sealed cables, which are terrific. The bike comes with a Selle Italia SL Flow saddle, which is a terrific saddle, except that it doesn’t fit me personally and causes pain. I knew this when I bought the bike, because I had already gone through a painful process of trying out three or four different saddles before I ended up with a Fizik Aliante on my road bike. So I immediately swapped out the saddle for a Specialized Phenom Expert, which is a mountain bike saddle also described as a good cyclocross saddle. I never really notice or think about this saddle when I ride, which must mean that it’s comfortable. The bike comes with light and stiff FSA SLK hollow carbon cranks, with a 36 / 46 chainring setup, which is fairly standard for cyclocross. I’ve found the 46 to be big enough to keep up on road rides, as long as you don’t mind a really fast cadence as the speeds get faster than 25. If you are a manufacturer and would like me to review your bicycling product, please contact me via the About page. Have any questions about this bike? Did I leave something out? Do you ride one and want to add something? Leave a comment! Yes, the Orbea cyclocross bike frames run larger. 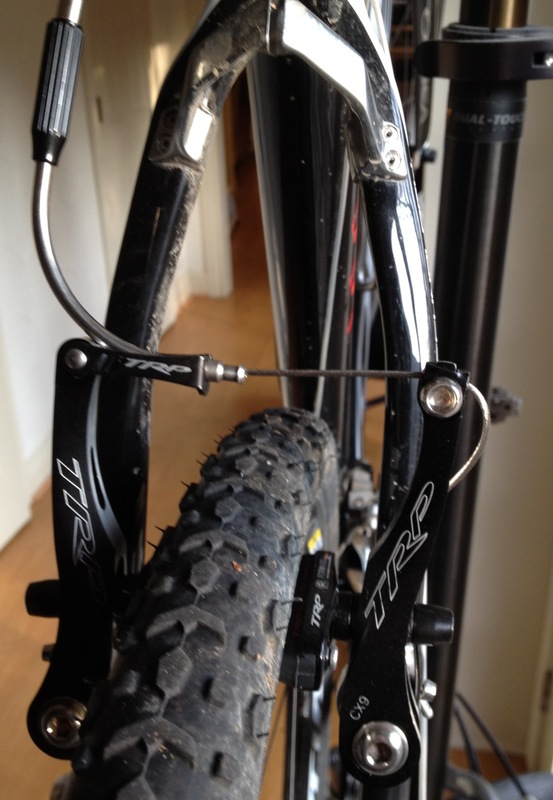 The reason is that the bottom bracket is a lot higher to give you clearance off road. I’m riding a 51 cm, when I typically ride a 53 cm or 54 cm road bike. My Orbea Orca is a 53 cm. If you go to a bike shop and stand over an Orbea cyclocross bike, you’ll quickly feel how a smaller frame size will be plenty big for you. Glad to hear it! Let us know what you think of the bike when you get it. blaakwater on Review: Serfas Thunderbolt (UTL-6) Taillight Rear LED Rechargeable Red Bike Light – Best and Brightest Ever?